Underwater Hockey (UWH), (also called Octopush (mainly in the UK)) is a globally played limited-contact sport in which two teams compete to manoeuvre a puck across the bottom of a swimming pool into the opposing team's goal by propelling it with a pusher. It originated in England in 1954 when Alan Blake, the founder of the newly formed Southsea Sub-Aqua Club, invented the game he called Octopush as a means of keeping the club's members interested and active over the cold winter months when open-water diving lost its appeal. Underwater Hockey is now played worldwide, with CMAS as the world governing body. The first Underwater Hockey World Championship was held in Canada in 1980 after a false start in 1979 brought about by international politics and apartheid. Games consist of two halves of typically ten to fifteen minutes (depending on tournament rules; 15 minutes at World Championship tournaments) and a short half-time interval of usually three minutes. At half time the two teams switch ends. A typical playing formation is 3-3 (three offensive players or forwards, and three defensive players or backs) of which 3-2-1 (three forwards, two mid-fielders and a back) is a variation. Other options include 2-3-1 (i.e., two forwards, three mid-fielders, and a back), 1-3-2, or 2-2-2. Formations are generally very fluid and are constantly evolving with different national teams being proponents of particular tweaks in formations, such as New Zealand with their 'box' (2-1-2-1) formation. As important to tournament teams' formation strategy is the substitution strategy—substitution errors might result in a foul (too many players in the play area) that can result in a player from the offending team being sent out, or a tactical blunder (with too few defenders in on a play). There are a number of penalties described in the official Underwater Hockey rules, ranging from the use of the stick against something (or someone) other than the puck, playing or stopping the puck with something other than the stick, and "blocking" (interposing one's self between a team-mate who possesses the puck and an opponent; one is allowed to play the puck, but not merely block opponents with one's body). If the penalty is minor, referees award an advantage puck: the team that committed the foul is pushed back 3 metres from the puck, while the other team gets free possession. For major penalties, such as a dangerous pass (e.g. striking an opponent's head) or intentional or repeated fouls, the referees may eject players for a specified period of time or the remainder of the game. A defender committing a serious foul sufficiently close to his own goal may be penalized by the award of a penalty shot, or a penalty goal to the fouled player's team. Since this is an underwater sport, surface spectators may be unaware of just how physical Underwater Hockey is. A low-volume mask with minimal protrusion from the face reduces the likelihood of the mask being knocked, causing it to leak or flood and temporarily blind the player. In line with the rules any masks must have two lenses since a single lens mask poses a significant safety hazard in the event that an unfortunately placed puck should hit (and possibly pass through) the lens. A variety of webbing strap designs are available to replace the original head strap with a non-elastic strap that further reduces the chances of the player being de-masked. 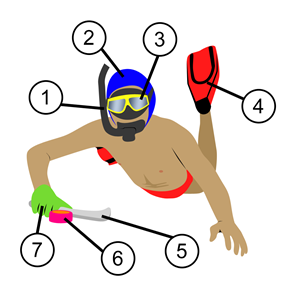 A snorkel enables players to watch the progress of the game without having to remove their head from the water to breathe. This allows them to keep their correct position on the surface, ready to resume play once they have recovered. In order to maximise the efficiency of breathing and reduce drag underwater they are often short and wide bore, with or without a drain valve. They must not be rigid or have any unnecessarily acute edges or points. Fins allow the player to swim faster through the water. A wide range of fins are used in the sport but large plastic/rubber composite fins or smaller, stiffer fibre glass or carbon fibre fins are commonplace at competitions. Once again they must have no unnecessarily acute or sharp edges, nor buckles. The stick (also referred to as a 'bat' or 'pusher') is relatively short (according to recent rules, not more than 350mm including the handle) and is coloured white or black to indicate the player's team. The stick may only be held in one hand, which is usually determined by the player's handedness, although players may swap hands during play. The shape of the stick may affect playing style and is often a very personal choice. A wide variety of stick designs are allowed within the constraints of the rules of the game, the principal rules being that the stick must fit into a box of 100x50x350mm and that the stick must not be capable of surrounding the puck or any part of the hand. A rule concerning the minimum radius of edges tries to address the risk that the stick might become more of a weapon than a playing tool. Construction materials may be of wood or plastics and current rules now supersede those that previously required sticks to be homogeneous, although they almost always are anyway. Many players of UWH manufacture their own sticks to their preferred shape and style, although there are increasingly more mass-produced designs to suit the majority (such as Bentfish, Britbat, CanAm, Dorsal, Stingray etc.). The puck is approximately the size of an ice hockey puck but is made of lead or similar material (Adult size weighs 3 lb (1.3-1.5 kg), Junior 1¾ lb (800-850 g)) and is encapsulated or surrounded by a plastic covering which is usually matched to the pool bottom to facilitate good grip on the stick face while preventing excessive friction on the pool bottom. The puck's weight brings it to rest on the pool bottom, though can be lofted during passes. Safety gear includes ear protection, usually in the form of a water polo cap to protect the eardrums and as a secondary indicator of the player's team (coloured black/blue/dark or white/pale as appropriate). Water referees should wear red hats. A glove should be worn on the playing hand to protect against pool-bottom abrasion and, in some designs, for protection against puck impact on knuckles and other vulnerable areas; however, no rigid protection is permitted. Players may choose to wear a protective glove on both hands, either as additional protection from the pool bottom or, for ambidextrous players, to switch the stick between hands mid-play. A glove used in competition must be a contrasting colour to the wearer's stick, but not orange which is reserved for referees' gloves. The goals (or 'gulleys') are three metres wide and are sited at opposite ends of the playing area on the pool bottom. They consist of a shallow slope leading up to a trough into which the puck may be pushed or flicked. Goals are commonly constructed from aluminium, galvanised or stainless steel. This helps to ensure that they are negatively buoyant and are durable in the chlorinated water of swimming pools. Refereeing the game are two (or three) water referees (i.e. 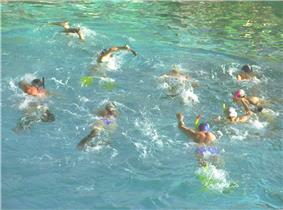 in the pool with full snorkelling gear, and preferably wearing a distinctive red cap, orange gloves and golden yellow shirt) to observe and referee play at the pool bottom, and one or more poolside deck referees to track time (both in the period and for each ejected player), maintain the score, and call fouls (such as excessive number of players in play, failure to start a point from the end of the playing area, or another foul capable of being committed at or noticed at the surface). The deck (chief) referee responds to hand signals given by the water referees to start and stop play, including after an interruption such as a foul or time-out, or indeed to stop play if he himself sees a rule infringement. The Official Rules which are available for download in PDF form without charge and define (with illustrations) a valid goal, the fouls and signals, and the dimensions of the playing area, sticks, and goals. 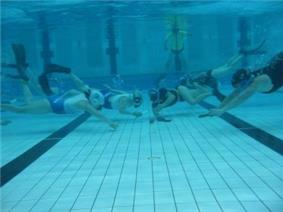 At a club or training level, Underwater Hockey is not particularly spectator friendly. Very few pools have underwater viewing ports, and since the action is all below the surface, one usually has to enter the water to see the skill and complexities of the game. Spectators may either put on mask, fins and snorkel and enter the pool for a view of the playing area, or possibly take advantage of the work of underwater videographers who have recorded major tournaments. Such tournaments often have live footage on large screens for the spectators which makes it a very exciting spectator sport. The 2006 (Sheffield, England) and 2010 (Durban, South Africa) Underwater Hockey World Championships were screened poolside and simultaneously webcast live to spectators around the world, while the 2008 European Championship in Istanbul, Turkey had excellent video coverage but no live streaming. Underwater Hockey was started in the United Kingdom by Alan Blake in 1954. Blake was a founder-member of the newly formed Southsea Sub-Aqua Club and he and other divers including John Ventham, Jack Willis, and Frank Lilleker first played this game in Eastney Swimming Pool, Portsmouth, England. Originally called "Octopush" (and still known locally by that name in the United Kingdom today) the original rules called for teams of eight players (hence "octo-"), a bat reminiscent of a tiny shuffleboard stick called a "pusher" (hence the "-push"), an uncoated lead puck called a "squid", and a goal known at first as a "cuttle" but soon thereafter a "gulley". Apart from 'pusher' and to a lesser extent 'Octopush' much of this original terminology is now consigned to history. The first rules were tested in a 1954 two-on-two game and an announcement was made in the November 1954 issue of Neptune, the then-official news sheet of the British Sub-Aqua Club. The purpose behind the game was to keep members of Southsea Sub-Aqua Club #9 from abandoning the new club during the winter months when it was too cold to dive in the sea. The first Octopush competition between clubs was a three-way tournament between teams from Southsea, Bournemouth and Brighton in early 1955. Southsea won then, and they are still highly ranked at national level today (they won again in 2009 and 2012). The sport spread to Durban, South Africa in the mid/late 1950s by the spearfishermen of the Durban Undersea Club (DUC), when dirty summer seas prevented the young bloods from getting their weekly exercise and excitement. The first games were played in the pool of club member Max Doveton. However it soon became so popular that weekly contests were held in a Municipal pool. 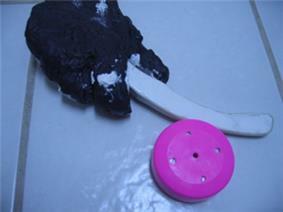 The UK's Octopush used a small paddle to push the puck whilst the South Africans used a mini hockey stick. The UK's version prevailed. Down under, Underwater Hockey has been played in Australia since 1966, again because of Norm Leibeck, the same Australian, who returned from Canada with his Canadian bride Marlene, and now attracts players from a wide range of backgrounds. The first Australian Underwater Hockey Championships were held in Margaret River, Western Australia in 1975. A Women’s division was added to the championships in 1981 and a Junior division commenced in 1990. British Pathe footage of an early game at Aldershot Lido in 1967  is evidence of the evolution of the sport in terms of equipment and playing style. It can be seen that the game was much slower and the puck was not flicked at all, in contrast to the modern sport where the substantial changes in equipment, team size, and other factors have helped make the game the international sport it is today, with 68 teams from 19 countries competing at the 18th World Championship in 2013 at Eger in Hungary making this the pinnacle in terms of international competition to date. Underwater Hockey enjoys popularity in the United Kingdom, Australia, Canada, France, the Netherlands, New Zealand, South Africa and the United States, as well as to a lesser extent in other countries such as Argentina, Belgium, Brazil, Colombia, the Czech Republic, Germany, Hungary, Italy, Ireland, Japan, the Philippines, Poland, Portugal, Serbia, Singapore, Slovenia, Spain, Switzerland, Turkey and Zimbabwe, and is gaining a foothold in numerous additional countries (but not Moldova and Hong Kong apparently). Historically, World Championships have been held every two years since 1980. At the Confédération Mondiale des Activités Subaquatiques (CMAS) 14th World Underwater Hockey Championship held in August 2006 in Sheffield, England, a record 44 teams from 17 countries competed in six age and gender categories. Participating countries were Australia, Belgium, Canada, Colombia, Hungary, France, Italy, Japan, Jersey C.I., the Netherlands, New Zealand, South Africa, Spain, Turkey, the United Kingdom, Ireland, and the United States. Subsequent world championships have been less well-attended, including the WAA World Championship held in 2008 in Durban, South Africa, until the 18th CMAS World Championship was held in Eger, Hungary in August 2013. This event once again saw all age and gender divisions, now including men and women in U19, U23, Masters and Elite categories compete. There were 68 teams competing across the eight age/gender divisions from 19 participating countries, making this World Championship the largest competition in the history of the sport to date. At Elite level France are the current Men's World Champions, and New Zealand are the current Women's World Champions. Teams representing Australia, Colombia, France, Great Britain, Netherlands, New Zealand and South Africa shared all 24 medal positions in the 8 age/gender divisions between them. CMAS has continued to organise international world competitions on a bi-annual basis during years ending with an odd number. CMAS tried unsuccessfully to hold another World Underwater Games event in 2009 after a successful event in 2007. These were intended to be multi-disciplinary events thereby grouping UWH with other CMAS-represented sports including fin swimming and underwater rugby. The 1st World Games were held in Bari, Italy in 2007 while the 2nd was scheduled for Tunisia in 2009 but was cancelled and re-scheduled as an UWH-only event held in Kranj, Slovenia during August 2009. It was billed as a World Championship but only one non-European country competed (South Africa); France won the Open division while Great Britain took the Women's title. In the years in between World Games CMAS holds Zone Championships (e.g. the 12th European Championship in Istanbul, Turkey during 2008). As part of this plan the Commission developed an Age Group-based International Championship incorporating Under 19, Under 23 and Masters (Men >35, Women >32) Grades. This Championship was held in July 2011 in Scotland was able to compete as a separate country rather than within a combined entity as Great Britain. ^ Davis FM, Graves MP, Guy HJ, Prisk GK, Tanner TE (November 1987). "Carbon dioxide response and breath-hold times in underwater hockey players". Undersea Biomed Res 14 (6): 527–34. ^ Lemaître F, Polin D, Joulia F, Boutry A, Le Pessot D, Chollet D, Tourny-Chollet C (December 2007). "Physiological responses to repeated apneas in underwater hockey players and controls". Undersea Hyperb Med 34 (6): 407–14. ^ Hockey Rules Volume 1 and 2,  & , retrieved 30/08/2012. ^ Rules Volumes 1 and 2,  & , retrieved 30/08/2012. ^ Blake, A. "The evolution of Octopush". Retrieved 2009-09-28. ^ "18th CMAS UWH World Championship 2013-Eger, Results". Retrieved 4 September 2013. ^ "NETHERLANDS OPEN YOUTH & MASTERS UNDERWATER HOCKEY TOURNAMENT". http://www.underwaterhockey-archive.com/. Retrieved 8 June 2013. ^ "CMAS,Sport,UWH Commission, Member Federations". Retrieved 029 August 2013.